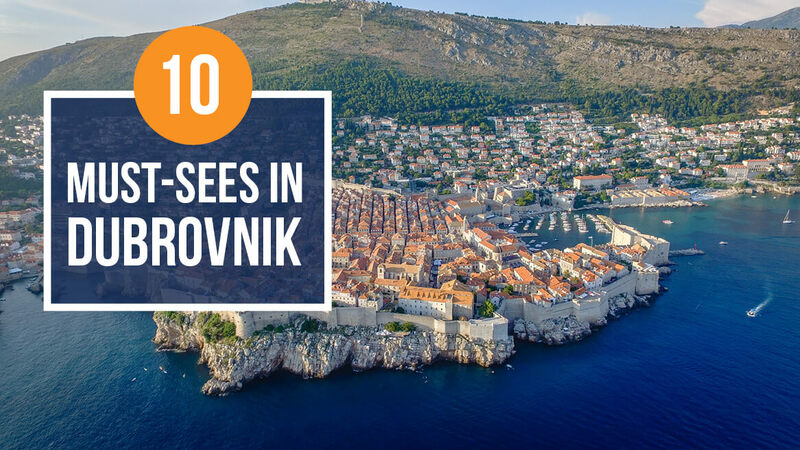 For your next tour to Eastern Europe, we recommend Dubrovnik. The two most popular sites here are probably the City Wall and the cable car, but there’s a myriad of other fascinating places to explore, from medieval palaces and forts to houses of worship and old museums. Let us show you ten of many things waiting for you in this unique city. This fantastic 16th-century palace is an architectural treasure overlooking the Luža Square. It’s a rectangular palace with an inner courtyard, built in the Gothic and Renaissance styles. The Sponza Palace served multiple purposes over the centuries, and today it houses the City Archives with documents dating all the way back to the 12th century, its oldest manuscript being from 1022. A Gothic edifice with the Renaissance and Baroque elements, the Rector’s Palace was the home and the seat of the Rector of the Republic of Ragusa (1300s-1808), but also the seat of the Minor Council and the state administration. It housed an armory, the powder magazine, the watch-house, and a prison, but in 1872, the Rector Palace became home to the History Department of the Museum of Dubrovnik. Overlooking the Old Port, the Revelin Fort was built as a detached fortress for additional protection of the eastern City Gate. It was completed in 1549, becoming the strongest fortress of Dubrovnik, surviving even the devastating 1667 earthquake. Both its interior and exterior are exquisite. Many events of the Dubrovnik Summer Festival are held on its terrace, and there is a unique nightclub inside, which often hosts parties and concerts. In the 11th century, the Venetians planned to build a fort outside the western wall to establish their rule in Dubrovnik, but the locals beat them to it, erecting a wonderful triangular structure with three terraces. Above the gate, the inscription in Latin states: “Freedom is not to be sold for all the treasures in the world”. Inside, there’s a lovely Chapel of St. Lawrence. Today, the fort is also a theatre, famous for the brilliant performances of Shakespeare’s ‘Hamlet’. Between 1438 and 1442, Onofrio della Cava built two fountains connected to the intricate aqueduct system he had just finished. In front of the St. Saviour Church, you’ll find Onofrio’s Great Fountain – a sixteen-sided container with a cupola. Each side has a unique stone-carved masked face and a faucet. Next to the City Guard Building, stands the beautifully ornamented Small Onofrio’s fountain that supplied water to the market on the Luža Square. The 14th-century Dubrovnik Synagogue is the world’s oldest Sephardic synagogue still in use and Europe’s second oldest synagogue. Located in the Old Town, in a three-storied Baroque stone building, it’s owned by the local Jewish community and is still an active house of worship during holidays and for special occasions. It’s also a museum, with old photos, documents, and many valuable items that tell the Jewish history in Dubrovnik, including a 13th-century Moorish carpet and a 13th or 14th-century Torah, both probably brought from Spain after the expulsion. After the 1667 earthquake, several Italian and Dubrovnik architects and a friar worked with stonemasons for four decades on this Baroque beauty, adorned with a grand Baroque dome, a cross vault, Corinthian columns, Baroque windows, a polyptych, and statues of saints. The Cathedral treasury houses invaluable relics (the 11th-18th centuries), including the gold-plated arm, leg, and skull of Saint Blaise, numerous paintings, a relic of the True Cross, church vessels, the Romanesque-Byzantine icon of the Madonna and Child, etc. The Dominican church and monastery were built in the 14th century, constructed against the city wall to strengthen its north-eastern flank, thus becoming a part of it. The St. Dominic Church is built in the simple Gothic style, with some Romanesque elements and very little ornamentation. The interior, though, is richly decorated. The monastery is one of Dubrovnik’s architectural treasures, while its museum houses many artifacts, paintings, jewelry, and other valuable items that tell Dubrovnik’s history. Situated at Placa (aka Stradun), Dubrovnik’s main street, the Franciscan Church and Monastery is a 14th-century complex that belongs to the Order of the Friars Minor, encompassing a church, a monastery, an inner courtyard, a library with over 20,000 valuable books, and one of the oldest still-operating pharmacies, in addition to numerous priceless artefacts displayed in its museum. The monastery was built in the late Romanesque and Romanesque-Gothic styles, while the church’s interior was reconstructed in the Baroque style. Poet Ivan Gundulić is buried in this church. Located in Trsteno, the Arboretum is one of the oldest in Eastern Europe, consisting of a late 15th-century Renaissance park surrounding the summer residence of the House of Gozze and a lovely 19th-century park at Drvarica. It was created by the noble family Gozze who asked the ship captains to bring seeds and plants from their travels, which the family planted in the majestic garden of their summer house. It is home to many gorgeous plants, including the two Oriental Planes that are over 500 years old and unique in Europe.